Every year on our little micro-farm brings new knowledge. Most of the things we've learned have come from making mistakes, and trying again. We added animals to our homestead even before we dug up the lawn and began growing our own food. 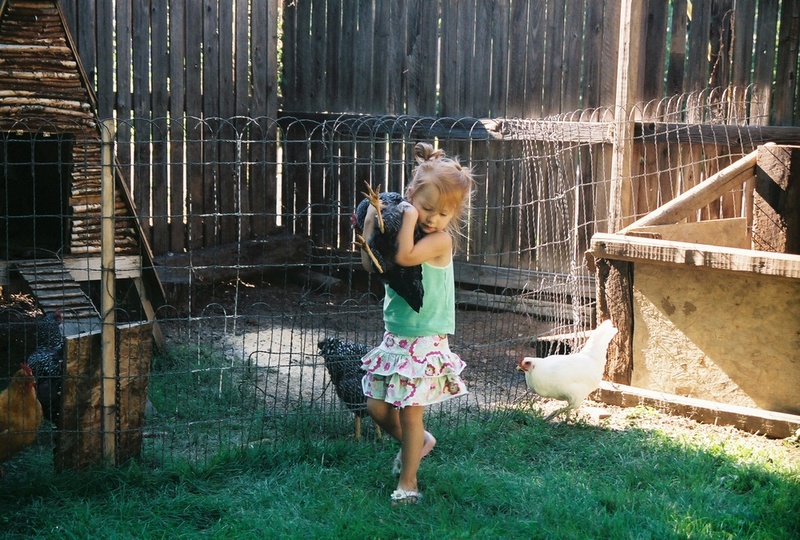 Since my husband and I both had grown up raising chickens, we started our first flock early. 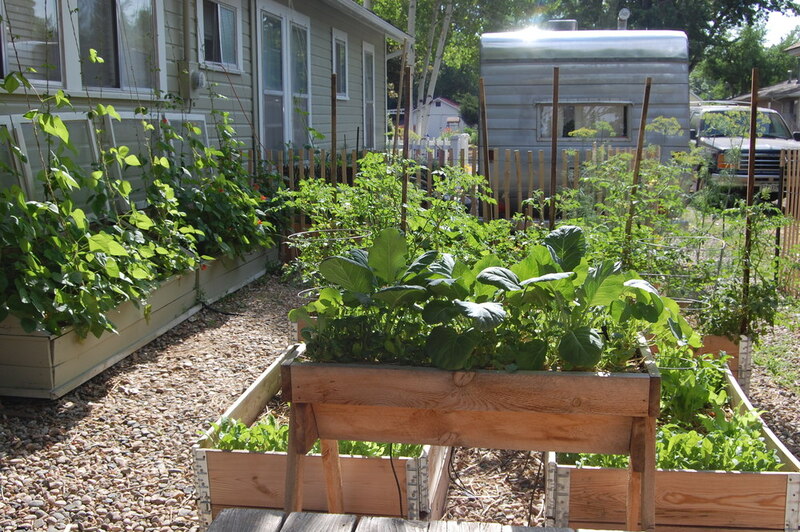 They provide us with a constant supply of fertilizer for the garden (by turning food scraps and yard waste into food for your garden). Every week,(ideally) the chicken coop is raked out, and the chicken manure and bedding is dumped into the compost pile. Chicken manure is 'hot' and cannot be used added directly to the garden until it has composted sufficiently. Having our chickens in with the compost pile is an ideal situation - as the chicken manure heats up the pile, adding extra beneficial bacteria to break down the yard and food scraps. The chickens scratch through the pile, eating the bugs and worms that are attracted to the decomposing material. The chickens benefit from eating the fresh yard and kitchen scraps, as well as the protein-rich bugs for added nutrition. The compost gets turned or aerated every month or so, and after about 4-6 months, we are able to add the rich, dark crumbly compost to our garden for the boost that keeps our plants thriving. Rabbits are another excellent source of manure. Unlike chickens, their waste can be added directly to the garden, so there is no waiting on the poop to compost before you can add it to your gardens. 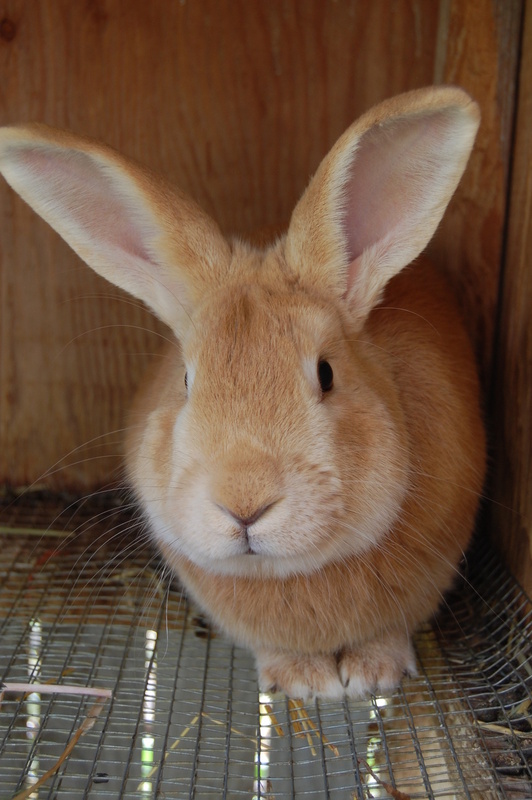 (read more here on why rabbit manure is the best.) Adding a worm composting bin directly below the rabbit hutch is another wonderful way to reap benefits from animals. Worm castings (vermicompost) is a highly desirable form of fertilizer that works especially well for seedlings. I am hoping to master this in time for next Spring's seed starts. Right now our worms are composting kitchen and yard scraps in a rubbermaid bin, but soon we will also have some underneath one of the rabbit hutches. They do an excellent job of scratching and tilling a garden bed after one crop is removed. Although I don't let our chickens out to scratch in my garden during the growing season, I like to let them get in and scratch for bugs after I remove a row of vegetables. 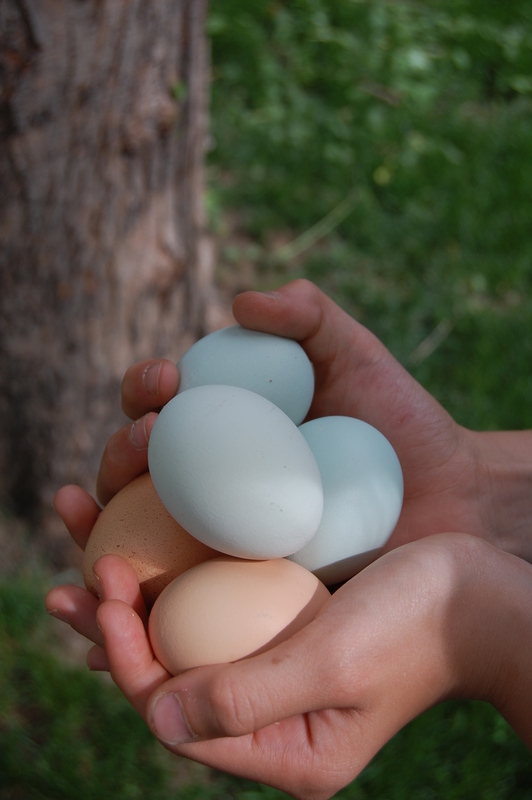 They provide us with a steady supply of fresh, healthy eggs & meat. Eggs are - of course - one of the main benefits of keeping chickens. There is no comparison to the pale yellow grocery store eggs from hens that never see the light of day (or any green or living thing to munch). Hens that scratch for bugs, eat green things and have fresh air produce healthy eggs with dark yellow/orange yolks full of omega 3 fatty acids, which are essential to good health. Most hens (during the warmer months) will lay about one egg per day - sometimes every other day. We have a flock of 19 hens and get about 12-14 eggs per day. (My daughter is now selling some to the neighbors!) If you are looking to save money on eggs by keeping chickens, the math just doesn't add up. Look at them as being partners with you in a sustainable garden & home. They do their job to keep everything going. Once our hens are past laying age (they only lay consistently for about 2 years), we butcher them. We also raise our rabbits for meat. We are still learning about how to keep our rabbits producing throughout the year. 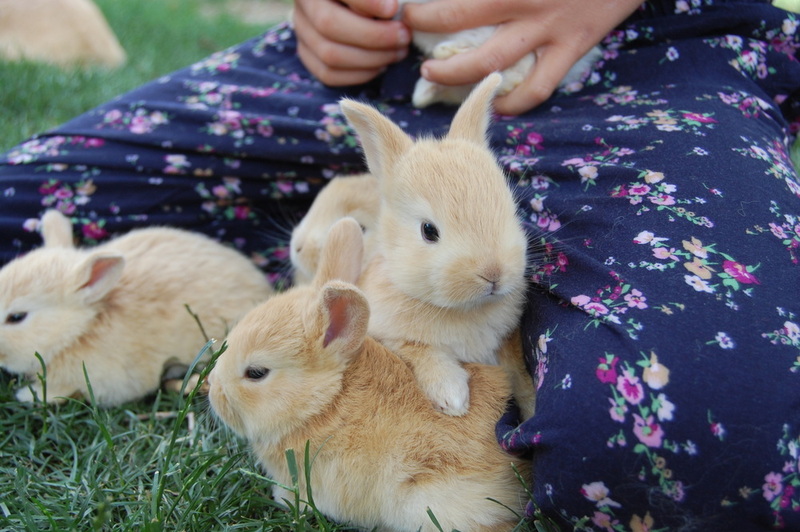 So far, we've only had litters of bunnies in the summer months. Rabbit is one of the most sustainable forms of meat you can raise. The amount of space to raise them is small, they are quiet, eat lots of common greens found in many yards (though caution must be taken - some things are toxic to rabbits), and they reproduce quickly - often with large litters. One of our does just had a litter of 6 - and in 4-5 months they will be at full weight, ready to head off to 'freezer camp'. The meat is delicious and mild tasting, very low in fat - and one full sized rabbit will feed our family for one meal. 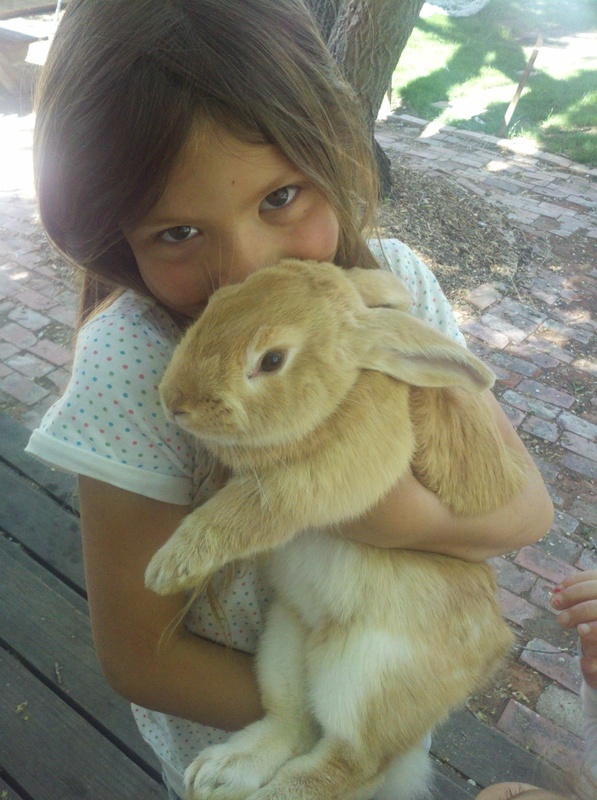 The best thing as far as the girls are concerned is - we will always have a steady supply of baby bunnies to play with. Once they are full-grown (and not so easy to cuddle) they become our dinner and the excitement builds for the next litter of bunnies to be born. I could write a whole post about how healthy it is for people to become more connected to the meat they eat... but I will say that our girls are learning to respect the lives of animals, where their food comes from, and the value of the process. For me, it's taught me to value the time and care it takes to raise an animal for food. It should never be normal to pay $.99/pound for meat. If we get used to paying so little for our meat, we will only continue to encourage the disastrous way that animals are raised (in CAFO operations) which is devastating our planet, making the animals (and humans who eat them) sick, as well as treating these beautiful creatures like objects, instead of valuing them and treating them with care. Here's a link to the place we purchase our meat from locally, and a site that will direct you to local sustainably raised meat in your area. They teach our children about responsibility & hard work. I wish I could say that our girls skip with delight when it's time to clean out cages or coops... but I would be lying. We definitely get the whining and dragging of feet when these routine chores are to be done. They are used to the daily routines of watering and feeding, collecting eggs - counting, recording amounts and washing them. Selling eggs and taking their animals to fair are all experiences that are preparing them for the responsibilities of life. Losing hens to a fox because the coop wasn't locked up tight - or waking up at night to screaming rabbits from a cage left unlocked (yes, they do scream when in danger) is no fun at all - but important to learn from, nonetheless. Helping to pluck chickens, placing the doe into the buck's cage to mate, researching ways to use the beautiful rabbit fur pelts... these are all adventures that may not be the average American child's normal... but in these ways - we are glad to be a bit abnormal!